Harriman City Hall is located at 609 North Roane Street, Harriman, TN 37748; phone: 865-882-9414. Photo: Colonel Gideon Morgan House, ca. 1810, 149 Kentucky Street, Kingston, TN. Listed on the National Register of Historic Places in 1983. Photographed by User:Brian Stansberry (own work), 2010, [cc-by-3.0 (creativecommons.org/licenses/by/3.0)], via Wikimedia Commons, accessed July, 2013. Kingston, seat of Roane County, was a busy place by 1800 because it was at the eastern end of Walton Road, which ran to Nashville. Nearby was the small frontier military post of Southwest Point, garrisoned to provide protection to the whites who were flocking in to expropriate the Cherokee land. The importance of the settlement as a state-route junction is evidenced by the three old taverns, or "stands," that remain. The settlers of the area were much excited in early May of 1797 when news arrived from Knoxville that the Duke of Orleans (later Louis Philippe of France) and two brothers would pass through this place on their way to Nashville, an itinerary planned for them by President Washington. The princes enjoyed their wilderness journey though they sometimes found it difficult to adapt themselves to frontier living conditions, and particularly to the food served in overnight stands. In 1807 Kingston was considered as the site for the State capital; the legislature met here for one day, September 21, before moving back to Knoxville. 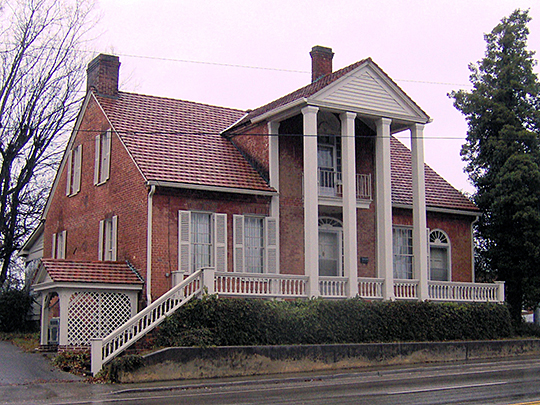 On a hill in the western part of Kingston is the site of the home of Colonel Robert King Byrd, who in the winter of 1864 organized a Union regiment in Tennessee. From the hill is a broad view of the Tennessee and Clinch River valleys.